Are you ready to learn about E-Medicine in Respiratory Care? I sure hope so because that is what this study guide is all about. With technology becoming more advanced, new computer applications are coming out each and every year. And this applies to none other than Respiratory Care as well. What this means is that we as Respiratory Therapists have to keep up with the newest and latest technology in order to do our job. Not to worry — all it takes is getting the hang of the core fundamentals. After that, you can just ride the wave, so to speak, as new programs come out. The best news is, this study guide can help you do just that. The practice questions found here correlate well with Egan’s Chapter 8, so you can use them to help prepare for your exams. Are you ready to get started? Then let’s dive right in! Oh, and by the way. If your RT school is like mine, then you probably use the Egan’s Workbook as well. Don’t get me wrong, it’s a solid workbook that can be helpful at times. The problem is, it takes way too long to look up all the answers, so it tends to be more busy-work than anything else. 1. What is the definition of E-Medicine? It refers to the use of computerized or digital technology to enhance efficiency and effectiveness of health care and more specifically patient care. 2. What are examples of E-Medicine? Digital applications related to electronic health records, disease management, etc. 3. What are electronic health records (EHR)? They are the sum of all electronic medical records produced by a patient during the different encounters with various health care entities throughout a lifetime. 4. What are electronic medical records (EMR)? They are computerized records produced every time a patient uses health services. They are owned by the hospital or health care organization. 5. What are examples of nonclinical information that is also saved electronically? Patient demographics, health insurance, history and physical exam, progress notes, labs/tests, and vital signs. 6. Why does it help that physician orders are also computerized? It saves time and reduces transcription errors due to handwriting clarity issues and also helps facilitate patient care and reduce medical errors. 7. What are the issues in health care organizations when it comes to software packages? Using separate software packages for individual functions. 8. What is the Health Information Technology for Economic and Clinical Health Act (HITECH Act)? It is part of a national strategy for building a national health information infrastructure. 9. Why is it good to use a single comprehensive software package to address issues? To provide integral functionality to enhance both efficiency and effectiveness, as well as comply with the HITECH Act. 10. What are some applications of electronics in diagnostics? Hemoglobin monitoring, blood gas and point-of-care testing, medical imaging applications, and pulmonary function testing. An application that allows for imaging storage, portability, communication, and clinical integration of all imaging modalities with the EHR. 12. What are the 2 applications of electronics in acute care settings? Mechanical ventilators and therapist-driven protocols. 13. What do mechanical ventilators have the potential to do? They have the potential to improve the quality and consistency of ventilator charting; also improve completeness, accuracy, consistency, and efficiency. 14. What do therapist-driven protocols do? Evidence-based protocols can improve health outcomes; automated protocols can assist with spontaneous breathing trials. 15. What is an example of an automated breathing trial? 16. What are the applications of technology in non-acute care settings and chronic diseases? To develop protocols to address main reasons for readmissions to emphasize patient and family education and follow-up. 17. What does technology do to help monitor asthma? It uses monitored patient data to tailor the adjustment to the plan of care. 18. What does technology do to help monitor COPD? E-medicine applications facilitate education, self-management, and timely feedback from health care providers for patient with COPD. 19. What are the 3 types of E-medicine treatments for tobacco use and dependence? Phone-based applications, internet-based treatment programs, and automated contacts via e-mail or text messages. 20. What are health informatics? They combine advances in computer science and technology to improve clinical care, manage the health of populations, and accelerate research. 21. What is business intelligence? A set of tools that permit capture, storage, and transformation of data into useful and actionable information. 22. What are key performance indicators (KPI)? Indicators of quality and efficiency that are selected based on reporting or operational requirements. 23. What is the purpose of telemedicine? It supports health care at a geographically different location from the patient to increase access to specialty care. 24. When coupled with an electronic health record, clinical decision is particularly useful in what? 25. What automated response care protocol has shown that the use of a handheld computer helped shorten the patient’s stay in the ICU? 26. The process by which the underlying primary, secondary, and other notable causes of a medical error are identified is referred to as what? 27. Which of the following are ways health care workers and facilities conform to HIPPA regulations concerning securing patient confidentiality within electronic medical records? Refraining from sharing passwords, accessing electronic patient information only on a need- to-know basis, and utilizing thumbprint protected security when available. 28. What entity is responsible for approving experimental procedures prior to collecting data? 29. What search engine looks for scholarly publications in a wide variety of fields and includes peer-reviewed manuscripts, abstracts, theses, and books from academic publishers, professional societies, and university libraries? 30. What is the name of the database often purchased and used by hospitals and university libraries to provide key research information on a large variety of medical topics? 31. Which of the following describes a database that is a structured collection of facts? It is valuable for each of the primary functions of respiratory care managers, including planning, organizing, directing, and evaluating. 33. What is clinical decision support? Systems that match the characteristics of individual patients and their clinical interventions, drugs, and diagnostic tests to databases of scientific evidence and drug calculations and generate tailored recommendations, reminders, or standing orders. It is instrumental in improving clinical outcomes of patients by determining optimal drug dosages. 34. What are the Clinical Simulation Exam objectives? To interpret data, recognize and prioritize problems, make decisions, observe consequences of decisions, develop leadership skills, develop interpersonal communication skills, develop team-building skills, use available resources, and manage stress and crisis. 35. What is Cochrane Collaboration? A website for research ensuring the effects of healthcare interventions are made available worldwide. 36. What are the common functions of computer applications in research? Data sources, data collection, statistical testing, displaying study results, managing citations and references, and managing ethical considerations. 37. What are the core functions of EHRs? Medical records, results recording, computerized physician order entry, clinical decision support, electronic communication, channels between health care providers and patients, and patient-entered data. A secured, password-protected, web-based database management system for documenting and reporting clinical educational activities for nursing and allied health professions, including respiratory care. Emerging computer applications in clinical care, diagnostics, management, education, and research. 40. What are electronic health records? Makes patients’ medical record available across the continuum of care of geographic locations. 41. What is Google Scholar? A search engine for scholarly publications in a wide range of fields– fast, yields wide-ranging search results and provides citation data. 42. What is a Hospital Information System? Also termed HIS for short — it is a comprehensive system for communication and information processing, supports both clinical and administrative purposes. 43. What is information retrieval? Enhances clinical expertise by providing information for the development of evidence-based, patient-driven protocols, and aids in clinical decisions for individual patients. The database of the National Library of Medicine of millions of references from thousands of journals related to medicine, nursing, the health care system, and science. An extensive collection of web-based information resources, including databases, journals, books, and searching software. Many medical libraries and large hospitals in the United States purchase and use Ovid in some form. A free search engine of the National Library of Medicine for health information. It searches several databases including Medline. 47. What are respiratory care management information systems? They provide a means to organize and assign respiratory care orders, measure staff productivity, report clinical results, and execute respiratory care protocols, along with generating data to show their effectiveness via outcomes research. The use of telecommunication and computer technology to promote access to diagnosis, monitoring, clinical decision support, and treatment for patients at medically underserved sites that are distant from health care providers. 49. What is point-of-care testing? It refers to blood gas analysis that is performed at or near the site of a patient, in a setting that is different from a normal hospital clinical laboratory. An example is the iStat that we use for ABGs. 50. What is effective information retrieval essential to evidence-based respiratory care? It enhances clinical expertise by providing information for the development of evidence-based, therapist-driven protocols, and it aids in clinical decision making for the clinician. 51. What is value-based purchasing (VBP)? It is a system of reimbursement by the government CMS to hospitals and health care providers that is partially based on their ability to meet a predefined set of standards. 52. What is continuing respiratory care education? Basically, it is education sought by respiratory therapists after graduation. 53. What are learning management systems? They are computerized, web-based platforms which are used to offer courses and other learning resources. Some examples are Moodle and Blackboard. 54. E-Medicine relates to the use of computerized or digital technology to enhance what? The efficiency and effectiveness of health care in general and more specifically patient care. They represent the computerized records produced every time a patient (or consumer) uses health services. 56. The EHR is the sum of what? It is the sum of all EMRs produced by the different encounters of the consumer with various health care entities throughout a lifetime. 57. Enterprise software packages are designed to provide what? Integrated functionality for health care organizations to enhance both efficiency and effectiveness of patient care. 58. 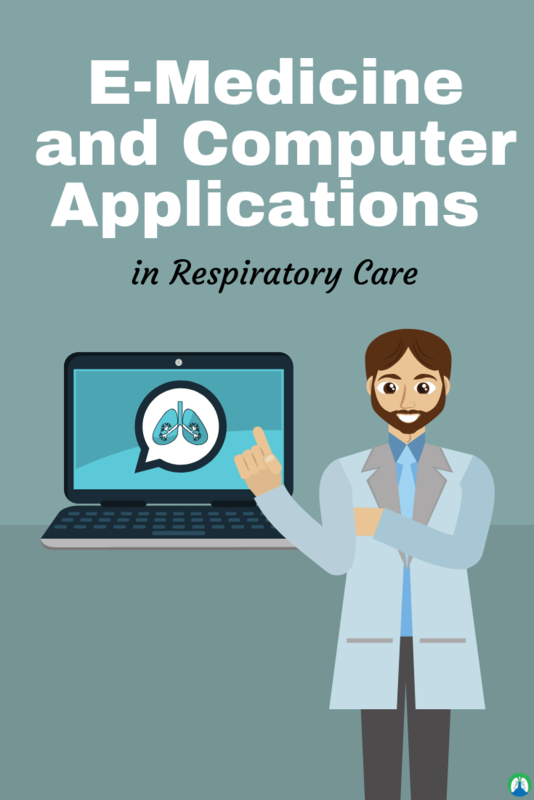 E-Medicine applications can be used in acute or non-acute settings by Respiratory Therapists to provide what? To provide support and care for the pulmonary patient. 59. Health informatics combines advances in computer science and technology to? To improve clinical care, manage the health of populations, and accelerate research. 60. Business intelligence refers to a set of tools that do what? That permit capture, storage, and transformation of data into useful and actionable information. 61. What does the CDS provide? It provides general and person-specific information, intelligently filtered and organized, at appropriate times, to enhance health and health care. 62. What are the four basic steps of Benchmarking? (1) Know your operation, (2) know the industry leaders or competitors, (3) incorporate the best, and (4) gain superiority. 63. Telemedicine and telemonitoring allow what? follow up of patients without travel. 64. The Internet is a rich source of information for? 65. Information retrieval is essential to practice evidence-based respiratory care because? It enhances clinical expertise by providing information for the development of evidence-based, therapist-driven protocols, and it aids in clinical decision making for the respiratory therapist. So there you have it. 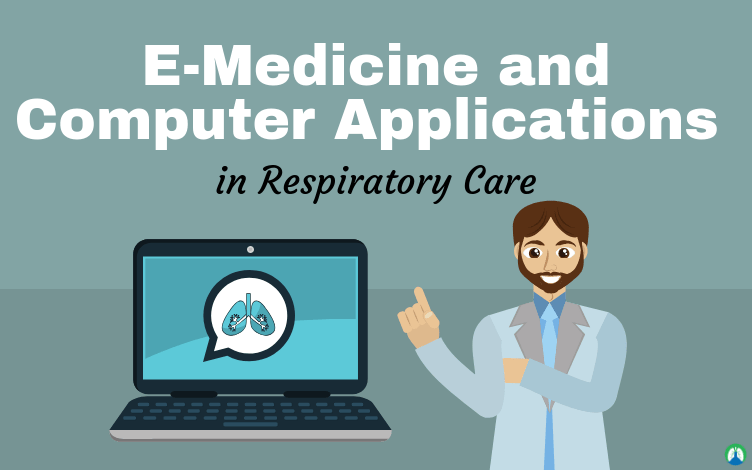 That wraps up our study guide on E-Medicine and Computer Applications in Respiratory Care. I hope that this information was helpful for you. And I hope that you can use it to ace your exams when that time comes. In the meantime, keep working and studying hard and thank you for using our study guides! Breathe easy, my friend.